With Apple’s World Wide Developers Conference (WWDC) in full swing, as part of the company’s annual festivities they have unveiled the next version of their venerable Macintosh operating system. Since shifting to free, yearly updates, the annual update has become a big part of the WWDC atmosphere, and this year is no different, as Apple continues to iterate in small (but important) steps with their desktop OS. But before we even get to features, let’s first talk about naming. Originally launched in 2001 as Mac OS X (and OSes before that going by Mac OS since 1996), in 2012 Apple unexpectedly dropped the “Mac” part of the name, leaving just OS X. This shortened name has always been somewhat odd, especially as later Apple OS projects for the Watch and Apple TV have standardized on [product]OS naming. So to bring the Macintosh OS back in line with the rest of the company’s OS names, what’s old is new again, and the OS is now macOS. With the return of the Mac, gone instead is the X, which originally signified the difference between Mac OS X and the original, classic Mac OS. But with Mac OS X set to outlive classic Mac OS as of next year, the differentiation is somewhat unnecessary at this point. Meanwhile in keeping with their mountainous codenames, this latest version of macOS will be Sierra, presumably named after the Sierra Nevada mountain range in California. Like the past couple of releases, Apple isn’t using an official version number in their public materials, but developer materials confirm that this will carry the expected 10.12 version number. Diving into features then, a lot of what’s going to be rolling out as part of macOS Sierra is going to be centered around convergence and/or interoperability with iOS. Though still distinct OSes, Apple has been slowly bringing over more and more iOS functionality to macOS over the years either for feature parity or interacting with iDevices, and macOS Sierra follows this trend. 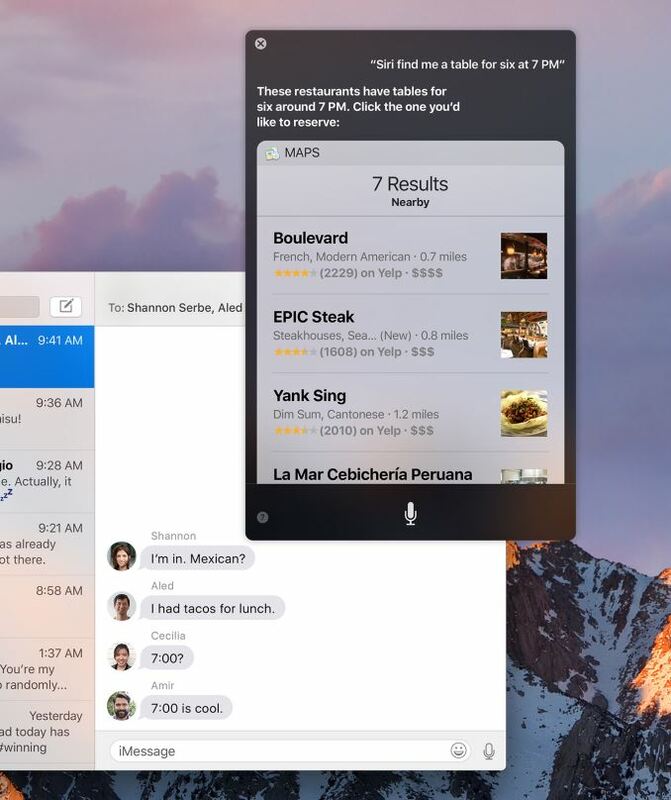 The marquee feature addition for macOS Sierra then is without a doubt Apple’s Siri personal assistant software, which has been a staple of iOS for a number of years now. As you’d likely expect, macOS version behaves almost identically to the iOS version, bringing over most of Siri’s iOS functionality, including scheduling, app automation/activation, and searching. Mixed with that is support for macOS’s desktop centric drag & drop functionality, as Apple wants to make sure that Siri is as much a part of macOS as it is iOS. This is admittedly an area where Apple is catching up; Microsoft has shipped their competing Cortana personal assistant with Windows 10 since last summer. And truthfully, I’m a bit surprised it took Apple this long to bring it over. But for users who make extensive use of this kind of software, it should be a welcome addition. I will however note that there hasn’t been any mention of macOS support for SiriKit – the API for developers to extend Siri into their applications – so it may be that macOS Sierra’s version of Siri won’t be quite up to par with its forthcoming iOS 10 counterpart. 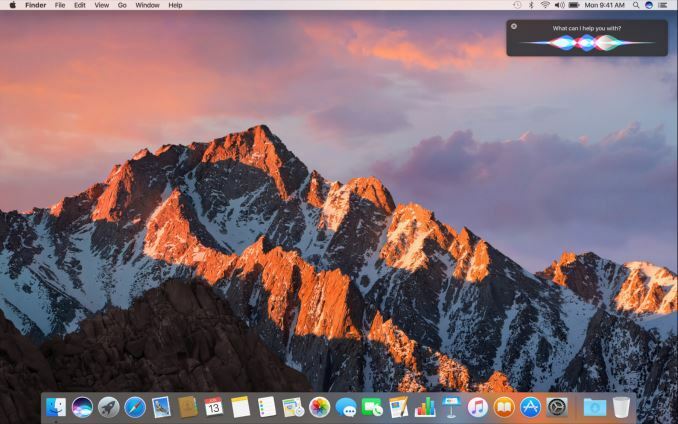 MacOS Sierra is also receiving much of the new app functionality that is being introduced in other core macOS/iOS apps. This includes the Messaging app, which isn’t undergoing any fundamental changes, but is adding features such as web link previews and inline video playback, along with a significant amount of graphical “fluff” such as larger emoji. iTunes is also inheriting much of the Apple Music functionality being rolled out to iOS’s Music app, keeping all of the different Apple Music-accessing applications in sync. Meanwhile when it comes to interoperability with iOS, Apple is adding a number of functions here. Judging from the developer cheers, the Universal Clipboard feature for iCloud will be especially popular. As hinted at with the name, Universal Clipboard allows for content to be copied and pasted between iOS and macOS devices, making data entry/retrieval from iOS devices much easier. For any time you’ve ever wanted to quickly and accurately type text and send it to your iPhone (which for me is often) this should do the trick. Interestingly this is billed as an iCloud feature rather than a Continuity feature, in which case this would mean that copying data won’t necessary be limited to devices in close proximity. 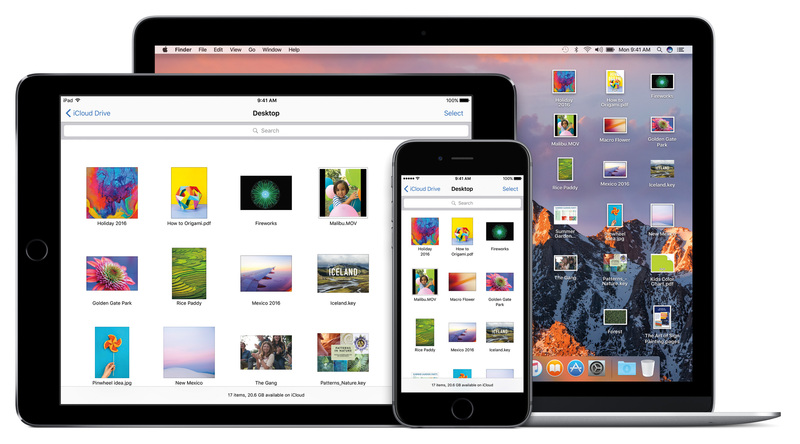 Speaking of iCloud, Apple has also expanded iCloud Drive’s functionality a bit, pushing it to a more generic cloud storage solution. For macOS Sierra, iCloud Drive will now be able to sync up the Desktop and Documents folders, moving away from the more application-centric approach it’s best known for. 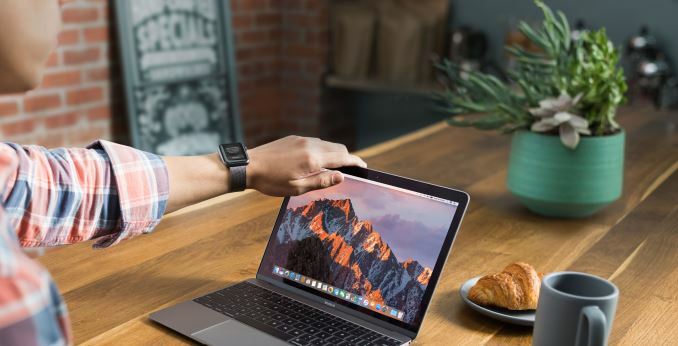 Apple is pitching this as a convenience feature; Mac users who are accustomed to saving files in those locations can now just access them remotely via iCloud as opposed to having to change their workflow to better mesh with how iCloud has traditionally worked. Moving on, in another case of macOS learning an iOS trick, Apple is bringing over the Apple Watch’s proximity unlock feature. Called Auto Unlock, an authenticated Apple Watch can be used as a proximity token to automatically unlock a Mac. This functionally has been provided by 3rd party applications on macOS over the last year, so while it’s not a strictly new feature it does mean that it has been promoted within Apple to now be a 1st party feature. Similarly, Apple Pay is going to be bridging over to the macOS universe with Apple Pay on the web. To date, Apple has allowed Apple Pay to be used to pay for card not present transactions (i.e. over the internet) with iOS apps, but now the company is embarking on a project to bring Apple Pay support to websites as well. 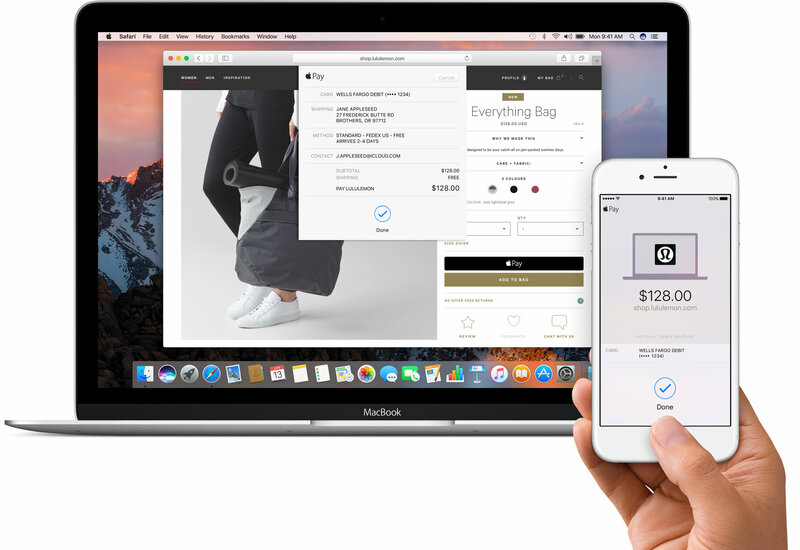 This is still an iPhone/Watch-centric feature, as only those devices can currently contain and generate the necessary payment tokens, but with macOS Sierra, those devices will be able to pass the token over to macOS so that users browsing/shopping on a Mac can pay with Apple Pay. As with Apple Pay in general, the advantage of this system is that retailers never receive complete credit card information, but rather just the one-time-use Apple Pay token, offering additional security and fraud prevention. However like the physical and iOS app versions of Apple Pay, this will of course require retailer support, so it will be interesting to see what retailer adoption is like. With the current iOS app support for Apple Pay already offering remote payments for iPhones, at first glance Apple Pay over the web seems like more of a Mac-centric feature, which means Apple can’t necessarily leverage the massive iPhone install base. Moving on, macOS Sierra will be expanding its tab functionality while also bringing over a form of Picture-in-Picture support. 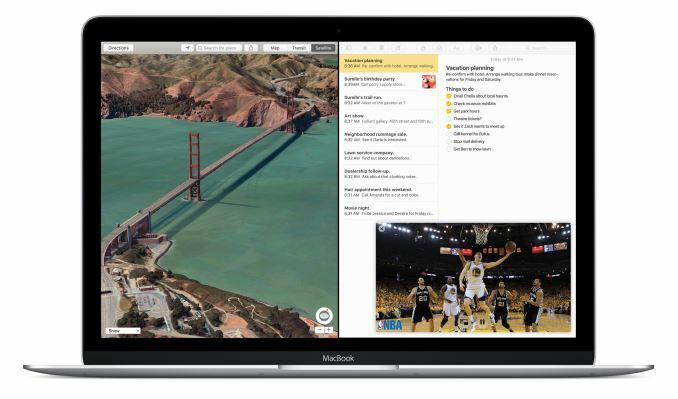 Apple has already allowed tabs in a few different macOS applications, and now this is being extended to further applications like Maps, Mail, and Pages. This functionality is also being extended to 3rd party applications, though it’s not clear at this time whether it’s going to require additional developer support. As for Picture-in-Picture, Apple is making it so that HTML5 videos can be pulled out of Safari and played in their own window, mimicking the PiP functionality of iOS on the iPad. Finally, on the subject of user-facing features, on the storage side Apple is introducing a new feature called Optimized Storage. From the details Apple has released so far, Optimized Storage appears to be a combination of traditional disk cleanup tasks and iCloud hosting. On the disk cleanup side, Optimized Storage is said to delete old, unneeded temporary files, such as caches, old installers, logs, etc. Meanwhile the feature can also move old, rarely used documents and other files to iCloud for remote storage, to free up local storage space. Given the capacities of modern Macs, it goes without saying that to free up any significant amount of space you’d have to move multiple gigabytes’ worth of files to the cloud, so the cloud-hosting aspects of Optimized Storage seems to rely pretty heavily on buying up to a larger storage tier on iCloud. "...along with a significant amount of graphical “fluff” such as larger emoji..."
Not that it's a big deal, but the emojis was a bit small in Messeges previously, so it's good they're increasing the size. Emojis may be fun and usable. ... it's a clear sign you are running out of really worthwhile ideas and innovations to talk about. To me the whole WWDC announcement stream was a big MEH. When did Apple slow down to 1/10th of its previous innovation and fast-copying speed?